IP routing protocols have one primary goal—to fill the IP routing table with the current best routes it can find. The goal is simple, but the process and options can be complicated. ■ A routing protocol fills the routing table with routing information. Examples include RIP and IGRP. ■ A routed protocol is a protocol with OSI Layer 3 characteristics that define logical addressing and routing. The packets defined by the network layer (Layer 3) portion of these protocols can be routed. Examples of routed protocols include IP and IPX. ■ The term routing type has been used in other Cisco courses, so you should also know this term. It refers to the type of routing protocol, such as link-state or distance vector. IP routing protocols fill the IP routing table with valid, (hopefully) loop-free routes. Although the primary goal is to build a routing table, each routing protocol has a very important secondary goal of preventing loops. The routes added to the routing table include a subnet number, the interface out which to forward packets so that they are delivered to that subnet, and the IP address of the next router that should receive packets destined for that subnet (if needed). An analogy about routing protocols can help. Imagine that a stubborn man is taking a trip to somewhere he has never been. He might look for a road sign referring to the destination town and pointing him to the next turn. By repeating the process at each intersection, he eventually should make it to the correct town. Of course, if a routing loop occurs (in other words, he's lost!) and he stubbornly never asks for directions, he could drive around forever—or at least until he runs out of gas. In this analogy, the guy in the car is like a routed protocol—it travels through the network from the source to the destination. The routing protocol is like the fellow whose job it is to decide what to paint on the various road signs. As long as all the road signs have correct information, the guy in the car should make it to the right town just by reading the road signs. Likewise, as long as the routing protocol puts the right routes in the various routing tables, the routers should deliver packets successfully. ■ To add new routes, or to replace lost routes with the best currently available route, as quickly as possible. The time between losing the route and finding a working replacement route is called convergence time. 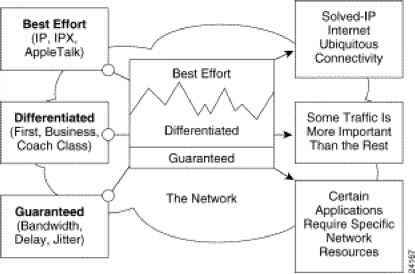 So, all routing protocols have the same general goals. Cisco IOS Software supports a large variety of IP routing protocols. IP's long history and continued popularity have resulted in the specification and creation of several different competing routing protocol options. So, classifying IP routing protocols based on their differences is useful.